Flick Packaging Co. - "Design & Fabrication of boxes to solve the world's packaging needs!" Welcome to the new Flick Packing Company website! In business since the 1930’s, Flick Packaging has developed the art of making boxes for items of various sizes and shapes into something of a science. Using systems and jigs born of decades of experience, we fashion heavy-duty cargo containers or lightweight plywood dustcovers and literally everything in between. We manufacture packaging systems cost-effectively, in whatever size and volume necessary to fulfill your specific requirements. You can find our packaging containers and products serving military and industrial needs on six of the seven continents on earth. With the recent conflicts in the Middle East we are hard at work building boxes to supply our armed forces with everything from armor to retrofit the Humvee fleet, Tents to keep our troops out of the desert sand and munitions to keep our tanks and planes lethal. 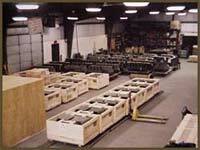 We take pride in serving our customers with the highest quality packaging materials and service. Send us your packaging requirements and we will be pleased to submit a competitive bid to serve your needs. We've been proudly supporting the US Armed Forces for over 30 years. Copyright © 2006-14 Flick Packaging.